Whenever I need a recipe for chocolate cupcakes, I usually use the one from this recipe. It is originally from the back of the Hershey’s cocoa can. And listen, I love it, but a few gripes I have with the recipe is that it makes an odd amount (30-32) when usually I want the standard 24, and the tops end up more on the flat side than on the domed, beautiful side of things. Neither of those issues are deal breakers, obviously, especially since the cupcakes are a) delicious and b) usually covered in frosting, but nonetheless, I’ve been on the search for a fool-proof chocolate cupcake recipe that yields 24 cupcakes and acquires the lovely dome shape. Thankfully, the recipe I found that accomplishes both of these feats also tastes magically delicious. 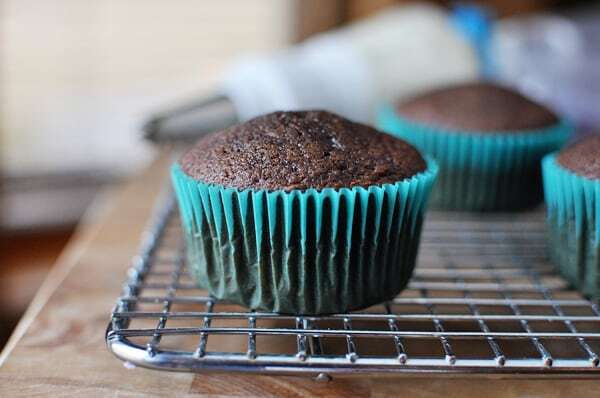 Sturdy yet moist with wonderful chocolate flavor, these cupcakes are definitely my new go-to when I need a chocolate cupcake base. I’m not saying I won’t use my other favorite now and again, but I like knowing I have a perfect, perfect, perfect chocolate cupcake recipe to use for any variety of occasions. Incidentally, I was making chocolate cupcakes a few weeks ago for an occasion that required them to be egg-free and since I knew I couldn’t fall back on my newfound chocolate cupcake recipe, I modified Jackson’s Wacky Cake recipe into cupcakes and seriously, the result nearly gave these perfect cupcakes a run for their money. Tender and chocolately and yes, beautifully rounded on top! I’ve added a variation to the recipe on the wacky cake post for cupcakes, in case you are interested in an egg-free option. And finally, in case anyone wonders, to get the flowery swipe of frosting over the tops of the cupcakes, I nearly always use this Quick Vanilla Buttercream recipe or if I have time and am not serving them to oblivious and non-discretionary Kindergarteners, the Magical Frosting recipe. I use the Wilton 1M tip for the decoration (along with a few other classic, large tips). 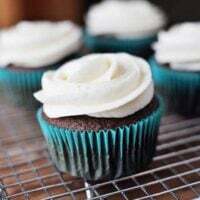 If anyone is interested in a simple cupcake frosting how-to, respond in the comments. I have 2-3 classic designs I use for the tops of the cupcakes that give them the bakery appeal but are super easy to accomplish, and I could whip up a post to demonstrate if there is interest. Preheat the oven to 350 degrees F. Line 2 standard cupcake pans with paper liners. In a glass liquid measuring cup, combine the cocoa powder and hot water and whisk until smooth. In a medium bowl whisk together the flour, baking soda, baking powder, and salt. In a medium saucepan over medium heat, combine the butter and sugar (I often do this in the microwave so I can use the same bowl for mixing). Cook, stirring occasionally, until the mixture is smooth and the butter is completely melted. Transfer the mixture to the bowl of an electric mixer (or to a stand-alone bowl, using a handheld electric mixer) and beat on medium-low speed until the mixture is cool, about 4-5 minutes. Add the eggs one at a time, mixing well after each addition and scraping down the sides of the bowl as needed. Blend in the vanilla and then the cocoa mixture until smooth. With the mixer on low speed, add the flour mixture in three additions alternating with the sour cream, beginning and ending with the dry ingredients and mixing each addition just until incorporated. So basically you'll add 1/3 of the flour, mix, then add 1/2 of the sour cream, mix, add another 1/3 of the flour, mix, add the rest of the sour cream, and finish with the last 1/3 of the dry ingredients. Divide the batter evenly between the prepared liners, filling no more than 2/3 full. If you live at a high altitude or have had overflowing cupcakes in the past, err on the side of filling the liner of one cupcake 1/2 full and baking it alone first to judge how the cupcake will rise in the oven. Bake the cupcakes until a toothpick inserted in the center comes out clean, about 15-18 minutes. Remove the cupcakes to a wire rack to cool completely. I feel a little silly I haven't tried this before now (5/2016) since this recipe has been on my site a while - if you were familiar with the original recipe it had some wacky measurements (1/2 cup plus 1 tablespoon cocoa powder, 1/2 cup plus 1 tablespoon water and 2 sticks plus 1 tablespoon butter). I made them today (for the millionth time) and decided to just nix all those extra tablespoons. And guess what? They turned out amazing. So I've edited the recipe but if you still feel strongly about those extra tablespoons, use the info in the parentheses above). Made these for a decorating party! They were De-lish! I am baking these in Denver for my grandson’s 6th birthday. Any adjustments needed for altitude? Thanks!! Hi Lisa, I’m not entirely sure as I don’t bake at high altitude, but you might try adding a few tablespoons more flour. Hi Mel. I have a bunch of cupcakes to make for multiple kid’s school Christmas parties. Can I double or triple this recipe in one bowl and then do them one batch at a time in the oven? Or would it be better to double or triple the recipe in one bowl and try to fit them all in the oven at once (after I buy more muffin pans)? Or is doubling in one bowl a bad idea to begin with? The batter can definitely be doubled or tripled as long as you have a bowl big enough so that shouldn’t be a problem. I bake in batches one after another and it works fine although sometimes if the batter sits for too long before baking, the cupcakes won’t rise quite as well. We made these this weekend and they were a big hit. These days when I need a recipe, particularly a baking one, I first search to see if you have one before doing a general google search. I’m always confident that yours will be great! So, thank you. How long would you bake for 2 round cake pans? I don’t know how the quantity of batter would fill up that size of pans, but I’d probably start checking after about 20 minutes. Thanks! For future reference it took about 30 minutes total. Hi – do these cupcakes freeze well? The recipe doesn’t account for the 1/2 cup of hot water? When do I add that? It’s right there in step #1, you whisk it together with the cocoa. Mel, there are no words to describe how amazing these cupcakes are! I love them with Dutch processed cocoa. I was just thinking you make these into homemade ding-dongs. They would be the best! Sorry about that Eileen – it’s 1/2 cup water. Hi Mel. I love these cupcakes and they turned out great, but I wondered why you melt the butter in a pan with the sugar and then cool it. Why wouldn’t you just cream the softened butter in the mixer and then add the sugar? Hi Beth – I’m not sure of the exact science but when I’ve made them that way, the cupcakes were drier than when using the melted butter technique. I’ve made these and they are Delicious!! I have one question. I’m looking to do vanilla cupcakes with these ones. Can I use this exact recipe and just on it the cocoa powder and hot water?? Unfortunately, converting a chocolate cupcake recipe to a vanilla usually isn’t as easy as that. You’d probably be better off to find a vanilla cupcakes recipe that’s already been tested. I have a dumb question. If I make these with my stand mixer, should I use the whisk or paddle attachment? I’d use the whisk attachment. I want to make mini cupcakes with your fantastic recipe. Would you know an approximate time for baking them? I would suggest about 7-9 minutes. Hi Mel, I would to try this cupcakes for a birthday. Just wondering if It’s possible to divide in half vanilla and half chocolate cupcakes. Would it work for vanilla cupcakes by omitting the cocoa powder? I haven’t tried that, Sue, but I’m guessing it would not. You’d have to make up the structural difference by omitting the cocoa powder with some flour and I don’t know how much. Your best bet would be to make a tested recipe of vanilla cupcakes. Mel I read through the comments on this recipe and I’m a frequent user of your fabulous blog. I’ve made this recipe twice and both times it came out fantastic. The first time I made the two round cakes and this time I made about 20 cupcakes. Both times, phenomenal. For the cupcakes, I baked at 350 for about 18-20 mins. I’ve not had any issues as previous users experienced. I use a blendtec blender as well and I think that can make a huge difference. I agree with a previous commenter who said the quality of chocolate may impact the chocolate cream. Although I’ve not had trouble with this recipe and using Ghiradelli chocolate, I have had issues with store brand chocolate and gnaches in the past. Oops, meant this for the gluten free cake recipe! I loved this recipe 🙂 They turned out great! Thanks! Where did you find the cute liners? I’m pretty sure I bought them on Amazon (they have a great selection of grease-proof liners). PLEASE do a how to on frosting a cupcake! Everything you make tastes FABULOUS, beside being beautiful!! If you do, will we get notified by email? I have made these several times. I will never make chocolate cupcakes from a mix ever again. I have used dutch process cocoa and unsweetened cocoa both with fantastic results. I have also subbed Greek yogurt for the sour cream and they have turned out delicious too. Thanks again for another amazing recipe. I made 5 batches of these for a bake sale this week and they really are perfect!!! I loved them. The texture is great, the flavor is great, and they domed up so beautifully! Thank you, thank you, thank you! And your frosting how to video was helpful, too. fyi I used part sour cream and part plain greek yogurt and it was good. Jill – Thank you for checking back in about the sour cream and yogurt combo. Mel is out of town this weekend and is not around internet, but she always loves hearing about substitutions that work well! Do you think I could sub greek yogurt for the sour cream? I made these cupcakes yesterday and they really are amazing! Dense, yet moist, and they peaked perfectly. I had a problem with melting the sugar and butter together. My pan got too hot and the sugar started to melt first and form chunks of sugar in my mixture. I started over and melted the butter first, then added the sugar and mixed it together on the stove top. Worked perfectly. Hi Shelby – I usually use a simple cake decorating bag (the kind found at Hobby Lobby) and fit it with a Wilton 1M tip and pipe a little swirl on top of the cupcake. Here’s a little how-to video. Hi do you use unsalted butter for the perfect chocolate cupcakes? Thanks the lemon ones are great! Would it be possible for me to cut the recipe for these cupcakes in half, as well as the chocolate buttercream in half? So as to get 12 cupcakes even? Certainly worth a try – I’ve never halved the recipe but I think it should work out ok.
Hey Mel. I LOVE YOUR RECIPES, I SWEEAARR!! Can I omit ‘sour cream’ from this recipe? Pls reply soon cause I can’t wait to give these cupcakes a try. Reham – Thank you! The cupcakes will be a bit more dense and dry if you leave out the sour cream so I’d suggest using it. Do you have to use the sour cream in the mix? I’ve never tried making them without the sour cream so you would have to experiment. I made these cupcakes last night. They were wonderful. First from scratch cupcake that doesn’t fall apart or cook up over the muffin cup and fall flat! Thank you for the recipe!!! Just made these today and these ARE perfect! They’re light, fluffy, and taste good too! Thanks, I will make these again for sure!!! Hmm..ok will adding a tablespoons more of cocoa make these more chocolatey? Thanks for the quick reply! I’ve made your Unbelievable Chocolate Cake recipe MANY MANY times. Needless to say, I am obsessed with it. However, do you find that as a cupcake that recipe seems a bit dry? I dont know… I really want to make that cake in cupcake form but I’m afraid of it tasting different than it does as a cake. Would you say this cupcake recipe is close to the flavor and crumb of that one? If not, how does this recipe differ? Hira – I think both this recipe (the Perfect Chocolate Cupcakes) and the Unbelievable Chocolate Cake are delicious as cupcakes. The Unbelievable Chocolate Cake (when made as cupcakes) is slightly lighter in texture and just a bit more chocolatey, in my opinion. Made big ones and minis of these. They were very good and moist. The bigger ones a bit moister naturally but still very good. Wondering if I could freeze these unfrosted….? Nicole – yes, these can definitely be frozen unfrosted. I’ve done it many times but I will warn you, if you are using grease-proof cupcake liners, they tend to peel away from the cupcakes during freezing/defrosting. will be making these choc. cupcakes tomorrow. would I use cake flour instead of AP? I tried to make some last week and they were like hockey pucks and looked like muffins. also, do you have a recipe for vanilla cupcaskes? I am not that fond of choc. but these sound wonderful. Hi Tom, I’ve always used all-purpose flour and it works great! I have a recipe for vanilla buttermilk cupcakes in the Recipe Index if you’d like to try it out. I need a frosting tutorial for sure! Your cakes all look beautiful. I am frosting challenged in every way! That is usually over looked because they taste good. I would love for my creations to taste good and LOOK beautiful! Raffie – you can definitely experiment with different methods and ingredients but I’ve only made the recipe as is. Thanks for the recipe quick question though, on melting butter, can i not put that on top of the stove and melt with sugar, rather cream the butter with sugar? I just took these cupcakes out of the oven and they are perfect! You promised a perfectly rounded little cake and that’s exactly what I got. Thanks! Love you’re recipes and appreciate all your hard work!!! They look so amazing! I’ve been looking at this for months, and I want to make a chocolate cake for an upcoming birthday, but I’m torn between this recipe and your “Unbelievable Chocolate Cake” one from some years ago. I want to make a moist, rich cake that I can frost with mint buttercream and pour a bit of ganache over. But I just can’t pick one! Would you say one of the two recipes is your favorite? I’m Angela from Australia and have been following your blog for a while now. I must say that you seem such a delightful person, which explains why I think your blog is so special. A very big thank you for all your hard work…particularly raising a family as well. I always use grams etc in my cooking so could you please tell me how many grams are in the cup of flour you use? So, I’m looking for a new chocolate cupcake to make this weekend and noticed a few different ones deemed “best” or “favorite” on your site. Would you say this one or schoolyard was better? Did you ever figure out the issue with the schoolyard frosting…I’d love to try it but am nervous. Thanks so much! Hi Katie – I definitely prefer these cupcakes (or the ones from the Andes Mint cupcake recipe). I haven’t made that schoolyard frosting in a couple of years. It worked the last time I made it, but honestly, it’s been so long, I don’t think I can guarantee the results. Sorry! These are, by far, the best cupcakes I’ve ever made! Real perfection! I have made and loved many of the recipes from your blog, but I think this one (with the Quick Vanilla Buttercream) is the one that I am MOST GRATEFUL for! 🙂 I needed to bring mini chocolate cupcakes to my SIL’s baby shower, and these are the recipes I went with. Even people who don’t like cake liked them!! I previously did not have a go-to chocolate cupcake or vanilla buttercream recipe- and now I do!! I will stop looking, and make these over & over again! And if anyone’s wondering, I used 1 tbsp. of batter for the mini’s, and they took 10 minutes to bake. As I was making these, I thought the method was really different, but it sure worked! Great results, thanks Mel! Mary – I’ve never made them as minis but usually when I do bake mini cupcakes, I check them after 8 minutes. Glad you are enjoying the recipes! Have you ever made these as mini cupcakes? If so, how long did you bake them for? P.S. I found your blog a couple of weeks ago and have made quite a few of your recipes. Everything has turned out great! You’re my new go-to when I’m looking for a recipe. Thanks! I made these and I must say they are the best chocolate cupcake ever. Indeed PERFECT! With this recipe, I made 6 regular cupcakes and a 9-inch regular cake. I did not bother to frost or ice either 😛 I felt that the cake tastes better than the cupcakes…more chocolatey, more fudgey, more dense. But that doesn’t mean the cupcakes were not great….they were indeed the best chocolate cupcake I had ever tasted. One more thing, how should I modify the recipe to make 12 regular cupcakes? You will probably never know how much I appreciate you. I’ve struggled with cupcakes lately. I’m helping a friend by making 1/3 of the cupcakes for her nephews wedding rehearsal dinner. Twice I made Martha Stewarts recipe in the last two weeks (with success before but not when it really counts)! They were flat and ran over and into each other so trying to take them out of the pan was ugly. This morning, after another failed attempt, I found your recipe. I just took them out of the oven and they are picture perfect and I am so happy!! You are awesome, thank you! Thank you! Thank you! These cupcakes were WONDERFUL! Thank you for sharing this with us! Hope you are doing well after the birth of the little angel! well, I haven’t tried the cupcake yet, but the batter is Delicious!! 🙂 Congrats on your chubby lovely lady!! My boys love chocolate cupcakes, but I’d prefer a brownie, so I can’t wait to try these out! And yes, please Mel, share your frosting wisdom with us!! I would also love a frosting how to! Please post the how to’s!! one should always have a good chocolate cupcake recipe in her arsenal! 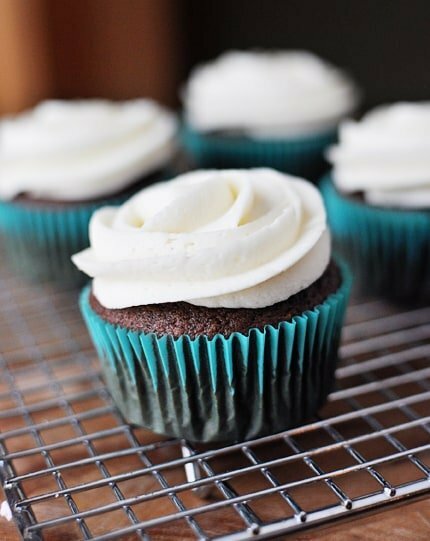 Yes, please post a how-to for frosting beautiful cupcakes like yours! I’d LOVE a how-to on frosting! I can never get my frosting thick enough to stand up and look fluffy and beautiful! Please do a how-to on frosting and how to frost!! I would love to see the how to on cupcakes!! Yes! “How to” would be awesome! Best wishes with the newest coming addition. You are amazing and I love your blog. Also would love to know how to pipe icing like you do! HELP! Major thanks for the egg -free cupcake recipe, my son’s BFF is vegan and my last attempt at a cupcake for him for my son’s b-day was … .. . weak. . . .very weak. .. so now I have a new one to try! THANK YOU!!! Any cookie or muffin ideas for the vegan kindergarten boy also very much in need of. . .!! Snack time at our house is sadly pre-packaged or just fruit when he comes over- would love to be able to bake a muffin or cookie that he can eat! I also would love to see your how-to on frosting! 🙂 Thanks! Yes!! A how-to is exactly what I need!! Please, pretty please?? I would LOVE to see some frosting “how tos”!!! And by the way, YUM! The cupcakes look delicious and I would love a how to. Lovely cupcake recipe, Mel. Any excuse I have to bust out my good quality cocoa powder is good enough for me. Would love to see your frosting tips, too. I used to be good at it but lately I’m a total klutz! Please show us how you frost cupcakes!!! These cupcakes look so good, Mel. I am always interested in your tutorials…they are the best! I made these cupcakes tonight and the Quick Buttercream Frosting and it was a hit! Definitely a keeper. Thank you! Please absolutely do a decorating post, including tip numbers. The ones above are beautiful! Yes please, I would love to know your decorating tips! Would LOVE and demo. I love your recipes. Everything I have made of yours turns out wonderfully and is so delicious. I love that everything is made from scratch. Thanks! Would love a “How to” cupcake frosting tutorial. Thanks for the gift of this blog….I am a busy mom and a kindergarten teacher, I adore my 10 minutes of “mommy time” that I get right before I make dinner to check my two favorite cooking blogs. You have given me so many great ideas and recipes for my family…thank you for your dedication. I would love a how-to! Look forward to when you have time! Oh, my little man turns 4 this weekend and requested chocolate cupcakes. I’m making these! I would love to see how you frost cupcakes. I bake a lot, but when I frost cupcakes they look like I just picked up a spatula for the first time yesterday. Thanks. These chocolate cupcakes do sound and look like the perfect kind! And I am horrible at frosting, and would greatly appreciate a “how-to”! Thanks! Hi Mel….wow….here it finally is! A chocolate cupcake!! I have to say…your schoolyard cupcakes are pretty good for a milder chocolate base for a cupcake as well. I would definitely be interested in a frosting “how-to”. Pleaaaasseee??? I need the How-To also! What is probably simple and common sense to some people just doesn’t translate in my brain without some instruction! Thank you!! Would love to see how to do the frosting. I can bake but it’s the finishing touches that need some work – I usually slap it on with a butter knife! There is interest! Show us how it’s done Mel! Ok, major note that a cupcake frosting tutorial would be appreciated. I’ll get on that! Hopefully I’ll get to it this weekend (assuming baby doesn’t arrive before then) but if not, know that I’ll work on it and post it as soon as all the madness (and gloriousness) of newborn baby dies down. Thanks for the response, everyone! The how-to sounds like a great idea! would love a “how to”. i need all the help i can get!!!!!! YES PLEASE on the frosting how-to. I usually use a mini offset spatula and just smear. I would love to know how to use the pastry bag and tips I have but haven’t had the patience to master. I would love frosting tips! Love to see your “how to”. What’s wrong with 32 cupcakes??? Heck yeah on the how to! You’re making me feel like I need to make chocolate cupcakes today. Not good! I often use Pioneer Woman’s chocolate sheet cake recipe, which I think yields about 24 cupcakes. I think they’re pretty tasty (and easy). I would love to see a how to on these cupcakes. They look so pretty!! I would LOVE a how-to on frosting the cupcakes! Mel, these look awesome. I am a huge cupcake fan. I made a cupcake, pushed junior mints in the batter and baked them. I piped your magical frosting on and made cute little dog faces for my sons birthday….they turned out so cute. That magical frosting is amazing. We all went nuts over it. Mostly, I was commenting to wish you well with your new baby. Having 3 boys, I am a little jealous of the girl, but good luck. I love giving birth and holding that little piece of heaven for the first time. You get to have that soon! I can’t wait to see what you name her, after I saw the name suggestions on Facebook. Beat wishes! I would LOVE a how-to on frosting cupcakes! I second Aubrey – I can never get it to look right so I just end up using a knife to slather it on. Which was rather disappointing for my third’s 1st birthday party last August. I made such fantastic cupcakes and then the frosting on top just looked, well, like it was done by my 4-year-old. I’d really like my hard work baking to look as fantastic as it tastes! I would love, love a how-to on frosting cupcakes. I’ve tried several times to give mine “bakery appeal” but it’s always resulted in epic failure and I’ve resorted to just slathering the frosting on with a spatula to get the job done. Please help! This is exactly the recipe I was looking for. I’d love the frosting how-to post! I know how to do the frosting you show above, but it’s the only one I know! So I would love to see a couple of variations of a frosting “how to”. Love reading your blog! I’m chiming in with everyone else and saying, please do the frosting how-to post! I am in the market for purchasing a set of icing tips and I have no idea what I need or don’t need. Would love to get your input! I’ll also add these cupcakes to my to-bake list. They look delicious! I would love the “how to” on the frosting. I really enjoy your blog! This could not have come at a better time! My son’s birthday is next Friday and he has requested chocolate cupcakes. Perfect! I would love a how-to on the frosting too. And good luck with the new baby! I would love a frosting how-to! Thank you for the great blog. I love the recipe and love to just read your little stories-Thanks!!!! I need to find that egg free version! My aunt has a severe allergy to eggs and would LOVE to indulge in a chocolate cupcake! 🙂 I would also love a frosting tip or too-definitely interested! 🙂 Hope you are feeling well! I agree, I would love a frosting tip or two! But seriously? Aren’t you busy having a baby and/or feeling miserable? I love your “whip up a post” comment. It takes me YEARS to add a post to my blog. You go, girl! Please do the “How To”!!! I would LOVE to see a frosting “how-to”!!! Pretty please? These look delicious and I plan on making them for a business meeting for my husband ~ Thank you for a new wonderful chocolate recipe!! !